Andy Gibb and the Next Gibb Generation. December 30th. 2017 Barry has been approved for a Knighthood in the the 'New Year 2018 Honours List' by Britain's Queen Elizabeth. June 26th. 2018 was the day when singer and songwriter Barry Gibb was knighted by the Prince of Wales during an Investiture ceremony at Buckingham Palace. His wife Linda and 3 of his children (Ali, Ashley and Michael) were with him at this special day. On behalf of all the fans and members of GSI, I would love to congratulate Sir Barry Gibb and his wife Linda: Lady Gibb, with this special honour. In our hearts it will be for all the Gibb Brothers. Please only contact me through my GSI email address: marion@brothersgibb.org not through facebook messages!!! as I cannot read all facebook messages and postings 24/7 Also be patient with waiting for answers as I receive hundreds of emails from all over the world!, Thank you. There is NO possibility for sending any parcels etc. to the Gibb family through GSI. 2. then send me an email with the request for a signed photo to: marion@brothersgibb.org and I might be able to help, however I cannot promiss a thing. 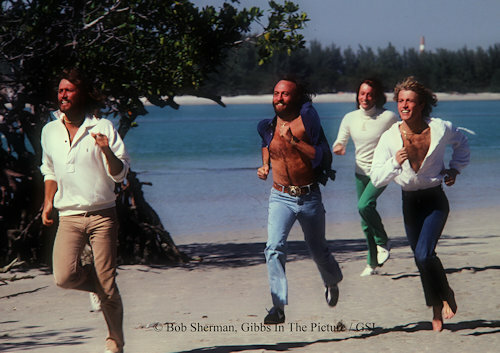 "GSI, Brothers Gibb and Bee Gees info"
Here you can share posts, photos, videos etc. "Italian Bee Gees: Tribute To The Legend"
Click for info Italian Bee Gees. Next Concerts 2019 (Pdf) Last updated: March 14 2019.
appearances, concerts, special events, releases etc. "Please Don't Turn Out The Lights"
"Timeless All Time Greatest Hits"
This site is dedicated to The Bee Gees also known as the Brothers Gibb: Barry Gibb, the late Maurice Gibb (1949 - 2003) and the late Robin Gibb (1949-2012). It brings you news, articles and lots of photos about their career and family life with their children, grandchildren and wives: Linda ,Yvonne and Dwina Gibb. The website continues to follow the career of Barry Gibb after the passing of his brothers and we hope this way to keep the Bee Gees music alive. Next to that Gibb Service International also maintains a special tribute section in dedication to youngest brother Andy Gibb (1958 - 1988). © 1999-2019 "Gibb Service International"